The APCC and the NPCC are working with police leaders to reform and transform policing by 2025. Globalisation and digitisation presents new challenges that have increased the complexity of the police task. Recorded acquisitive crime has fallen but there have been significant increases in cases of child safeguarding and domestic abuse. Serious and organised crime generates new threats, like human trafficking. Terrorism has become more fragmented and harder to combat. As people do more and more online, the threat from cybercrime grows. Policing has to develop new tactics and capabilities to meet these threats and keep people safe. It also has to ensure it provides effective, value for money service that the public can trust. 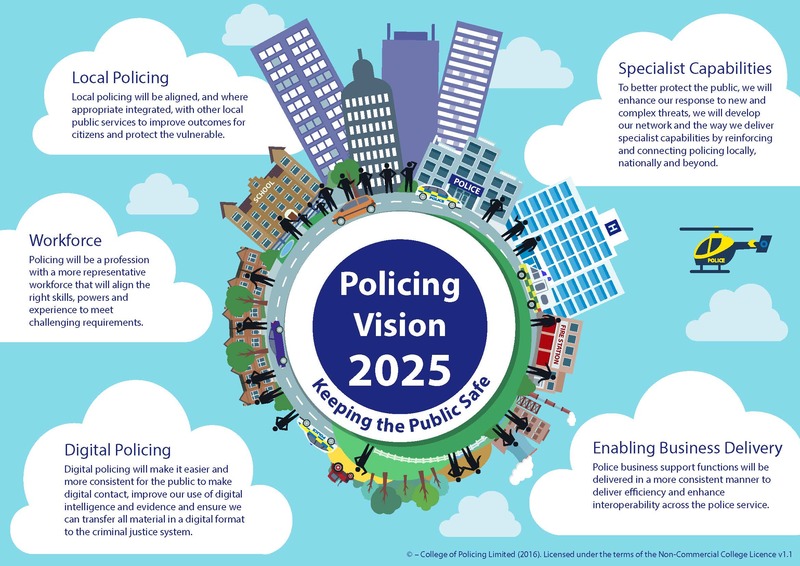 The APCC, with the NPCC, Staff Associations and the College of Policing, has published a vision for policing in 2025 that sets out why and how the police service needs to transform. The vision was launched at the APCC/NPCC Partnership Summit in November 2016 and is available here . improving collaboration in business support services (enabling business delivery).